Virginia “Ginny” Lee, the granddaughter of Bill Wagner, now manages the restaurant and event venue named after her. Ginny has worked in many facets of Wagner Vineyards operations, but she appropriately found her place in the family business at the Café. Ginny has worked at The Café since she was in middle school and although very humble, she is extremely proud of the great honor her Grandfather bestowed upon her. Vachel Mitchell, “Chef Mitch,” is a native of New York’s Southern Tier region and has been our Executive Chef at the Ginny Lee Café at Wagner Vineyards since 2003. A graduate of the Culinary Institute of America, Hyde Park, N.Y., his experience ranges from intimate café dining to corporate food service. Mitchell is inspired by French and American cuisines while infusing local ingredients and styles. Come try some of his delectable creations for yourself! 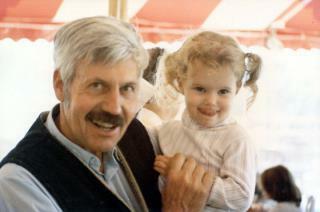 Bill Wagner with his granddaughter, Ginny Lee. Ginny now manages the restaurant named for her. Bill Wagner’s philosophy has always been that wine and food are a natural and enjoyable combination. One of his original concepts for the winery was the addition of a restaurant where people could be introduced to the affinity of wines and food. A natural step in the evolution of Wagner winery was the opening of The Ginny Lee in 1983. The Ginny Lee offers a delightful selection of foods and utilizes only the freshest fruits and vegetables in their preparation. All of our menus have been designed to complement and enhance the medal-winning estate wines of Wagner Vineyards and craft brewed beers from Wagner Valley Brewing Co. Our wine list consists of approximately thirty wines, vinified in a wide range of styles. Our beer list includes several regular brews as well as seasonal offerings. Designed with a vista overlooking the vineyards and Seneca Lake, The Ginny Lee is the ideal place to enjoy a delightful and relaxing meal whether on a casual outing or for a special occasion. The contemporary design of the large open dining area with its cathedral ceiling and vast expanse of windows provides a warm, inviting atmosphere at any time of the year. The Ginny Lee is also a delightful setting for wedding receptions and other special celebrations and events. For more information. A Must Stop for Tour Groups! We welcome bus groups with advance reservations. The combination of a tour at Wagner Vineyards and a meal at The Ginny Lee has become a highlight for bus groups touring the Finger Lakes area. The Ginny Lee offers large groups a variety of dining options. Delicious buffet style menus (or sit down, depending on number of diners) are available. Please use our Event Inquiry form if you would like to receive additional information regarding Tour Group visits to Wagner Vineyards and/or The Ginny Lee.